I bought popcorn for a film night a few months ago, but then forgot about it when I decided that coke floats (ice cream scoop in a glass of coke, for the uninitiated) were more fun. Recently I rediscovered the popcorn, and thought eating it plain would be just too boring. Instead, I've mixed popcorn into melted marshmallows and sprinkles, let the mixture set and cut it into squares. These are an adapted version of the rice crispie squares that many of us enjoyed as kids. I used Nigella Lawson's recipe, exchanging popcorn for the rice crispies and adding a ton of sprinkles. They took less than ten minutes to make from start to fridge, so are perfect for any party or when you are too busy to do anything extravagant. Got leftover popcorn? Make some today! Place the butter in a large heavy-bottomed saucepan and melt on a low heat. Add the marshmallows and stir occasionally until melted. Pour the popcorn into the pan and gently fold it into the marshmallow mixture. Decorate the top with sprinkles. Transfer to a deep roasting/brownie tin that has been lined with baking parchment. Cut into squares and serve (I used cupcake cases as a non-sticky portion holder). I'm entering these into The Biscuit Barrel Challenge, hosted by Laura at I'd Much Rather Bake Than... The theme this month is no bake. Haha, thanks! It did garner a lot of approving comments at work. 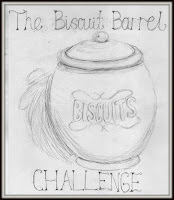 I'm glad to see these entered into the Biscuit Barrel - I was thinking about them just yesterday! That's so nice of you to say!